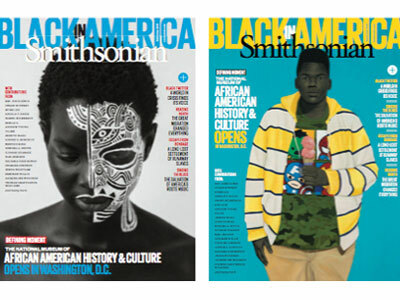 Featuring work by Oprah Winfrey, Spike Lee, Isabel Wilkerson, Natasha Trethewey, Jenna Wortham, Touré and more. The issue, which hits newsstands Tuesday, comes with one of four different covers, each one an artist or photographer’s meditation on the title idea. Within its pages, editors have gathered writing from contributors across a spectrum of fields and disciplines. They include Oprah Winfrey, Spike Lee, physician and NASA astronaut Mae Jemison, Rep. John Lewis, The Warmth of Other Suns writer/Pulitzer author Isabel Wilkerson, U.S. Poet Laureate Natasha Trethewey and NYT Mag writer Jenna Wortham, among others. There’s also an essay by Lonnie G. Bunch III, director of the soon-to-be-opened museum, in which he describes the museum’s conceptualization and creation and explains why learning about African-American history is important for all Americans. If you want a head start, the first article, Keeping the Blues Alive, is up and it’s penned by Touré. In it, he focuses on an annual blues festival in Memphis as an entry point into the past, future, and meaning of the blues.